Mark Aubert calls his Chardonnays hedonistic: 100 percent barrel-fermented and aged mostly in new French oak, the wines are ripe and full-bodied, staying true to their California origin with vibrant white fruit and citrus flavors. 2017 Bordeaux: A chart offers an alphabetical list of all 2017 Bordeaux barrel samples reviewed for the tasting report in this issue. 2016 Germany Whites: A free chart offers an alphabetical list of all 2016 German white wines reviewed for the tasting report in this issue. WineSpectator.com: Bonus Video: Aubert in the Vineyard: The winemaker talks viticulture, and how Lauren vineyard got its name. WineSpectator.com: More than 570 wines were reviewed for this report. A free alphabetical list is available. WineSpectator.com members can access complete reviews for all the wines tasted using the online Wine Ratings Search. WineSpectator.com: Bonus Video: French vs. American Oak: Kendall-Jackson's Randy Ullom explains how Chardonnay is influenced by the type of barrel it's aged in. WineSpectator.com: More than 250 wines were reviewed for this report. A free alphabetical list is available. WineSpectator.com members can access complete reviews for all the wines tasted using the online Wine Ratings Search. WineSpectator.com: More than 505 wines were reviewed for this report. A free alphabetical list is available. WineSpectator.com members can access complete reviews for all the wines tasted using the online Wine Ratings Search. WineSpectator.com: Bonus Video: Pairing Wild Rabbit with Shiraz: Winemaker Matt Fowles introduces a favorite pairing in this 2016 Video Contest Finalist. WineSpectator.com: Cooking with the Stars: Find more menus, for every occasion, from the world's best chefs. WineSpectator.com: More than 370 wines were reviewed for this report. A free alphabetical list is available. WineSpectator.com members can access complete reviews for all the wines tasted using the online Wine Ratings Search. WineSpectator.com: Drinking Out Loud: Find more of Kramer's provocative essays and lively online discussions. WineSpectator.com: Want the recipe? Get it for free and watch a video clip about the pairing. Beautiful 2010 Brunello: Altesino owner Elisabetta Gnudi Angelini says Montalcino is where elegance is made, especially in 2010, when her Brunello riserva earned 96 points. A Perfect Match: Roast Salmon with Chardonnay: Find out more about this intriguing pairing—and get the recipe from chef Jorge González of Pasquinel Bistrot in Puebla, Mexico. 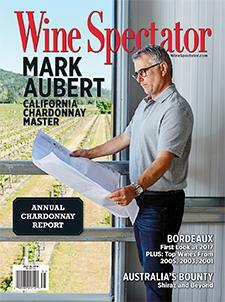 Advance: Peeks at picks from upcoming issues of Wine Spectator. Ratings Flash: Sign up and we'll let you know when we've added new reviews to our Wine Ratings search from your selected favorite wine regions. 374,000+ WINE REVIEWS Use our powerful online search to find the latest scores and tasting notes, check your cellared wines to keep tabs on their recommended drink windows and their latest auction prices, or delve into the historical performance of the world's great collectibles.